AIM CranVerryTM + is Back and Better than Ever! After being gone from the product lineup for two years, AIM CranVerry has returned. And its time away was time well spent. 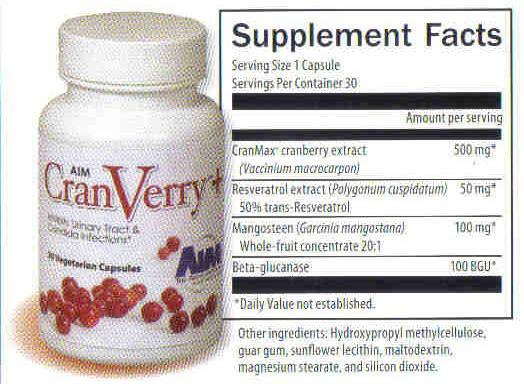 AIM CranVerryTM+, the new cranberry extract product from The AIM CompaniesTM, features the outstanding benefits of all-natural cranberries that are concentrated through an extraction process that involves all components of the berries, including the seeds, in order to provide ideal urinary tract support and urinary health. Plus, AIM has added Candida inhibitor ingredients that include a standardized extract of resveratrol (a plant nutrient), a 20:1 concentration of mangosteen fruit, and an enzyme called beta-glucanase. These four great ingredients make CranVerry+ like no other urinary health product on the market. The main ingredient in the CranVerry+ vegetarian capsules is cranberry extract, a healthful fruit extract that has been used in clinical studies for more than 12 years (AIM uses CranMax® as the source for its cranberry extract). Known for a variety of health benefits, cranberries are of particular importance when it comes to urinary health and preventing urinary tract infections (UTI). UTIs are the second most common infection in women and the most common infection in older adults. A bladder infection is caused by the introduction of bacteria, usually Escherichia coli (E. coli), into the urinary tract. Once inside, the bacteria thrive in the warm, moist environment. Ultimately, they begin to affect urine production and the function of the bladder, resulting in painful or frequent urination, nausea, and fever. Recurrent UTIs may also increase the risk of incontinence in women after menopause. In the elderly, consequences can be much more severe, including mental deterioration and respiratory distress. UTIs are a serious health problem, affecting more than 150 million people each year worldwide. Cranberries can combat a bladder infection by preventing the bacteria from clinging to the walls of the urinary tract. These pathogens can then be flushed out in urine, resulting in no damaging effects to urinary health. The specific characteristic of cranberries that performs this feature is proanthocyanidin (PAC) compounds, and while other fruits carry these same compounds, only the PACs in cranberries and blueberries have been shown to have the stick-free effect on urinary bacteria. A recent study has shown that the amount of CranMax cranberry extract in one capsule of CranVerry+ has the equivalent anthocyanin content of seven eight-ounce glasses of cranberry juice. 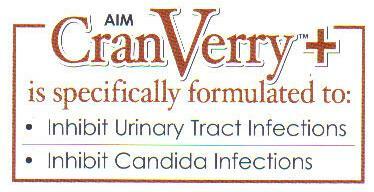 CranVerry+'s other calling card is its ability to combat Candida yeast infections. While Candida on its own is usually not harmful to the body, an overabundance can cause a myriad of health concerns, including fatigue, weight gain, and toxification. We are at increased risk for Candida overgrowth due to the prevalence of processed foods in modern diets, the increased use of antibiotics, and the rise in obesity and diabetes. Along with cranberry extract, the second ingredient in CranVerry+, resveratrol, which studies have shown, disrupt Candida's ability to become pathogenic in the body. Resveratrol is a naturally-occurring phytonutrient that occurs in several plants. Research completed in 2007 noted that the fungicidal effects of resveratrol demonstrated its potential as an antifungal agent. Derived from Japanese knotweed, the resveratrol extract in CranVerry+ is standardized to 50 percent trans-resveratrol. The trans refers to the orientation and, therefore, the stability of the functional aspects of each resveratrol molecule. The third ingredient in CranVerry+, mangosteen fruit concentrate is a 20:1 concentration of the superfruit and includes the whole fruit, including the rind, which contains active components that belong to a group of xanthones (plant phenols). Studies have shown that xanthones have a wide scope of antibacterial activity and kill Candida within twenty minutes of exposure. Assisting mangosteen in the Candida fight is beta-glucanase, the fourth and final active ingredient in CranVerry+'s new formula. To understand this enzyme's role in the battle with Candida, it is important to understand how biofilms and infections occur in the body. Biofilms are used by microorganisms as a way to remain adhered to surfaces inside the body. Up to 60 percent of human infections are attributed to biofilm, due to its role as a protective shield that enhances the survival and reproduction of microorganisms. Candida albicans, a pathogenic species associated with candidiasis, secretes beta-glucans within the biofilms, and these beta-glucans are believed to contribute to Candida's resistance to drug therapy. The enzyme beta-glucanase found in CranVerry+ is a carbohydrate enzyme that breaks the bonds within beta-glucans. This breakdown reduces the viability of the biofilm thus weakening C. albicans' resistance to drug therapy. This can lessen the symptoms related to a Candida infection. This unique and powerful combination of phytonutrients and enzymes provides CranVerry+ with the weapons it needs to inhibit urinary tract and Candida infections. After two years out of the AIM product lineup, CranVerry+ is ready to make a bold return. Welcome it back, and give your urinary health a boost. So if you have a bladder infection or want to be ready for the next bladder infection that comes along read below on how you can obtain this great new and improved product.